We have a dedicated team including reception staff, nursing staff, physicians, physiotherapists and anaesthetists who will make the pre-operative planning as smooth as possible. It is important that once the surgery is booked you read the relevant booklet that will highlight all the important information. An appointment will be made for you to attend a pre-admission clinic with our physician to check your general health, check your medications and prepare you for the anaesthetic. At the same visit, you will be seen in the pre-admission clinic by a nurse and a physiotherapist to advise you on what to bring into hospital, exercises and to discuss discharge planning. Remaining active while waiting for your surgery is an important key to success – the stronger and more flexible you are, the quicker you will recover. Gentle movements such as walking, range of motion exercises and swimming can help you stay strong and flexible. Seek your doctor’s advice before beginning any exercise. If you are a smoker, you should try and give up at least six weeks before to help reduce the risk of complications. All infections should be cleared up prior to surgery to prevent infection from spreading and affecting your new joint. You must say if you suspect you have an infection, as your surgery may need to be rescheduled. 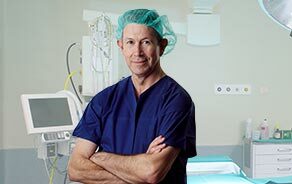 Finally, commit to the success of your surgery – you, your physician, the physiotherapist and your family must work together as a team, adopting a positive attitude and gaining a clear understanding of the common goals and expectations of the procedure. Ensure you arrange transport back from the hospital as you will not be allowed to drive yourself home; line up a friend or relative to help you at home for a week or two. Make simple preparations around the home to make the transition as easy as possible - before you leave, put your TV remote control, radio, telephone, medications, tissues, address book and a glass on a table next to where you will spend most of your time when you come out of hospital. Stock up on food that is easy to prepare such as frozen meals, cans and staples such as rice and pasta. Before leaving home, have a long bath or shower, cut your nails (remove any nail polish), wash your hair and put on freshly washed clothes. This helps prevent unwanted bacteria coming into hospital with you and complicating your care. Personal belongings including toothpaste, toothbrush, hairbrush, comb, face cloths, towels, deodorant, soap, shampoo, shaving equipment, underwear, robe. Slippers or flat, rubber-soled shoes for walking. A tracksuit or other suitably loose-fitting, comfortable garment for daywear in the hospital and for wearing home. Any medication you are currently taking, together with a list to give to nursing staff detailing necessary strength, dosage and timings. Remember your nebuliser if you suffer with asthma. Leave all valuables such as jewellery, credit cards, cheque books and any other items of personal value at home. Wedding rings may be left on as these will be taped up prior to going into theatre. A member of the nursing staff will show you around the ward. You will be given an ID bracelet and should be asked if you have any known allergies. If this is the case, you will be given an additional red bracelet which alerts the rest of the team to this. Blood will be taken to confirm your blood type for cross-match purposes if necessary, and to ensure your haemoglobin levels are satisfactory. You may be measured for a pair of surgical stockings to wear after the operation (these will be put on by the nursing staff) to help reduce the risk of blood clots. The physiotherapist may visit and discuss a post-operative exercise program to mobilise you as soon as possible after surgery. The anaesthetist will visit you to discuss the anaesthetic. He/she will enquire about your general health, whether or not you are a smoker, whether you currently have any prostheses, wear contact lenses or have any dental crowns. A member of the nursing staff will talk you through the operation and what to expect before and after. He/she will advise you when not to eat anything prior to surgery; however, you may be permitted water and certain clear fluids up to 2 hours before your surgery. You will be given a consent form to sign. This shows you understand the procedure and are in full agreement for the consultant to proceed. A member of the operating team will visit to mark up the leg which is to be operated on.